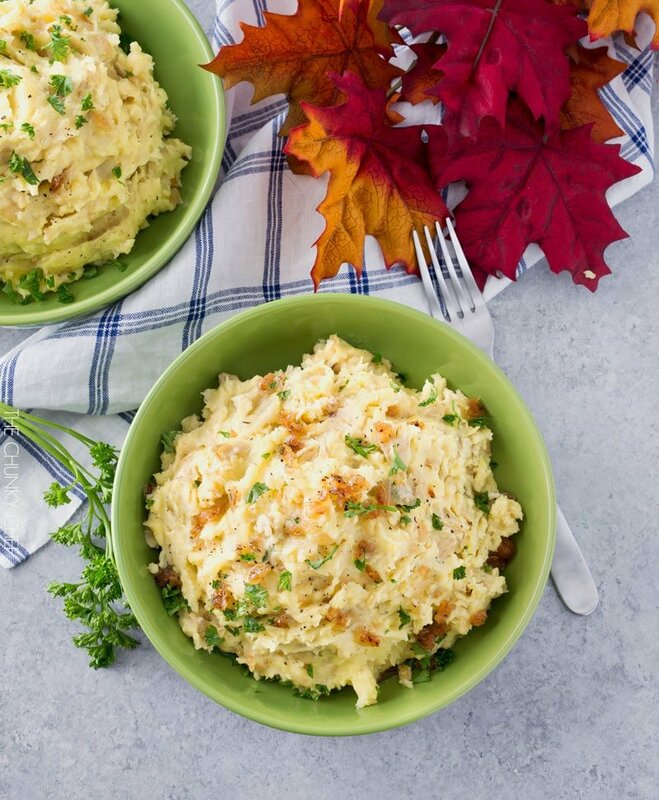 These horseradish mashed potatoes with caramelized onions are an exciting twist on a traditional dish… full of mouthwatering flavor combinations! 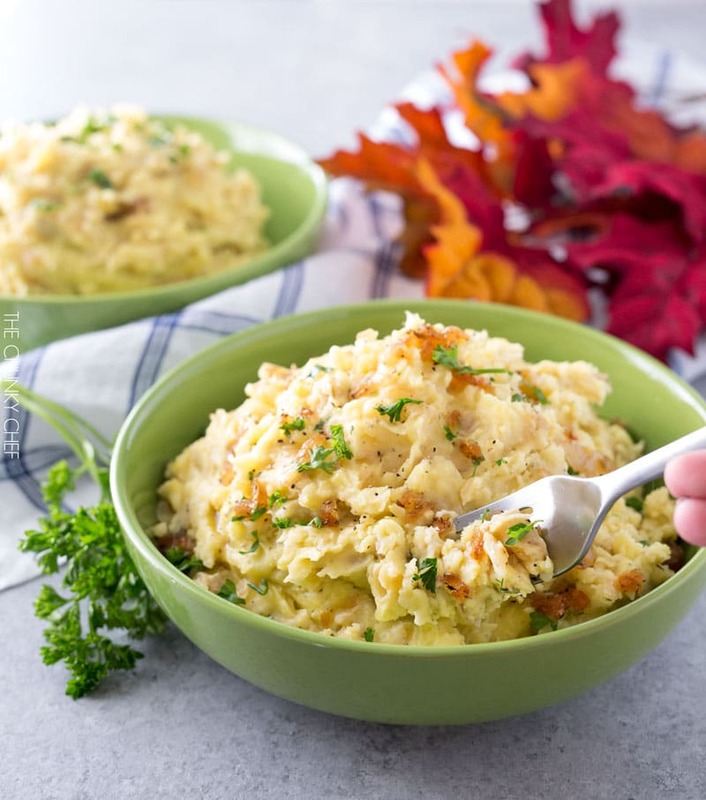 One bite of these horseradish mashed potatoes with caramelized onions and you’ll never want regular mashed potatoes again! 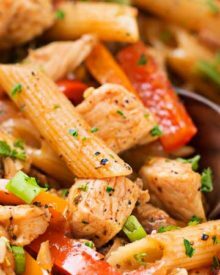 The flavors compliment each other wonderfully, and this dish is sure to “wow” any guests you serve it to! Post may contain affiliate links… meaning if you click on the link and make a purchase, I’ll get a very small percentage in commission. There’s never any extra cost to you, and I only link to products I actually own and use. Your support is greatly appreciated! Can you believe that Thanksgiving is just about 6 weeks away?! Omg, how is this even possible? It’s one of my favorite holidays, yet somehow, it sneaks up on me every year lol. Last year we had the big dinner at my Mom’s house, and I brought a few side dishes. I’m not sure what we’ll do this year, but I’m pretty sure these horseradish mashed potatoes with caramelized onions WILL be one of the side dishes I’ll bring! 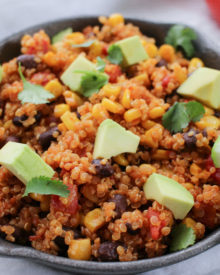 You guys, if it’s possible to be in love with a food dish… then call me smitten. I can’t get enough of these potatoes!! I’m a sucker for ANYTHING with caramelized onions (like this dip, or grilled cheese), and the horseradish in these just takes it wayyyy over the top! 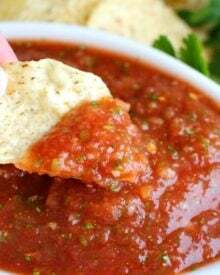 And don’t worry about the horseradish being too spicy, you can definitely decrease (or increase) the amount to your tastes. 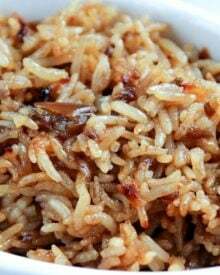 The way I’ve written the recipe, it’s a great backnote, a hint of heat at the end of the bite… and one that’s really counterbalanced with the slightly sweet caramelized onions. 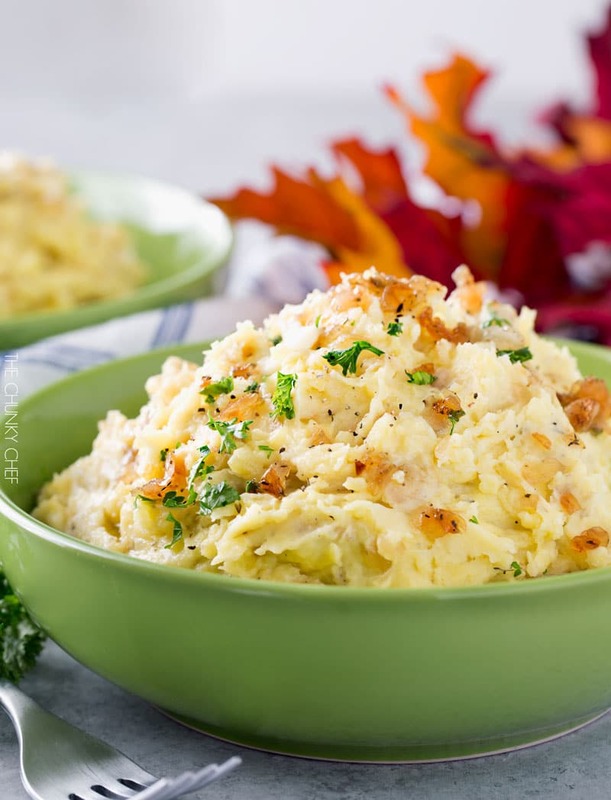 You definitely don’t have to wait for a special occasion to have these potatoes… they make a great side dish! 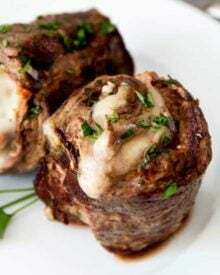 Try them alongside my absolute favorite seared steak with some slow cooker mushrooms and a salad for a terrific complete meal. 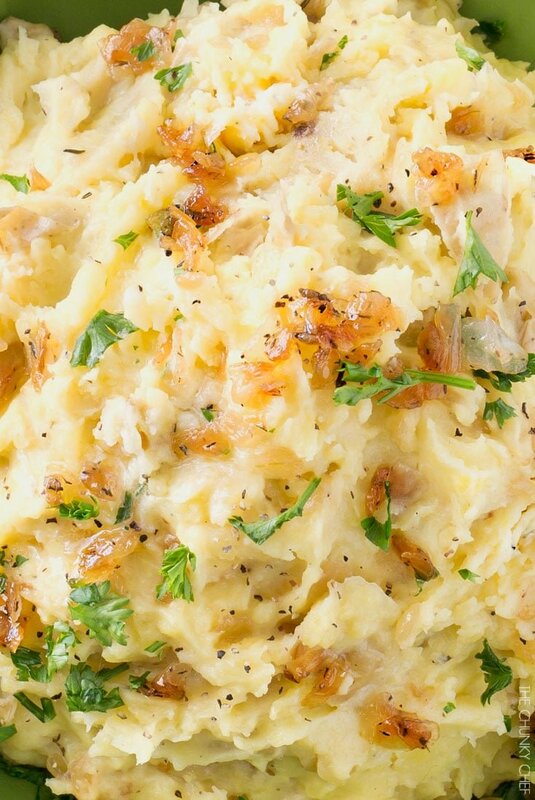 Have you ever made homemade mashed potatoes, and they just didn’t turn out all that great? It’s super disappointing! 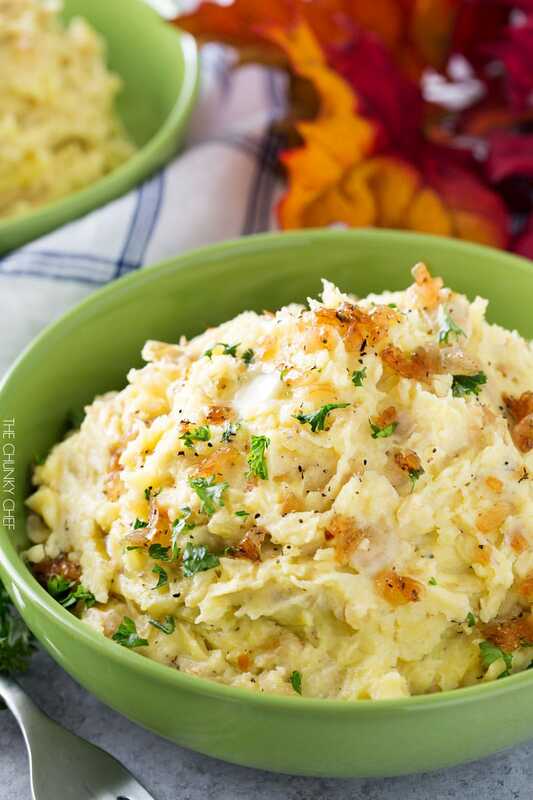 Here are a few of my tips for perfectly fluffy mashed potatoes! 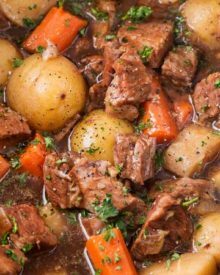 Also, for a big gathering, like Thanksgiving, you can make these potatoes a few hours ahead of time and toss them in your slow cooker on the “keep warm” setting, and they’ll be ready when you are! 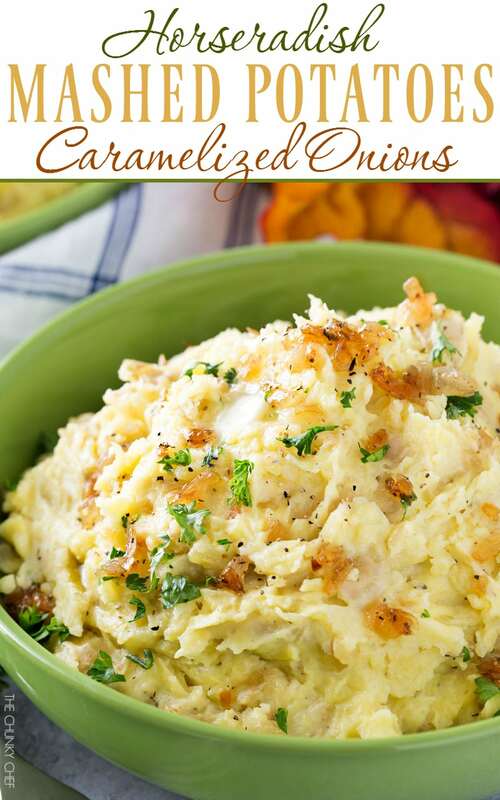 I hope you give these horseradish mashed potatoes with caramelized onions a try soon… your taste buds won’t regret it! 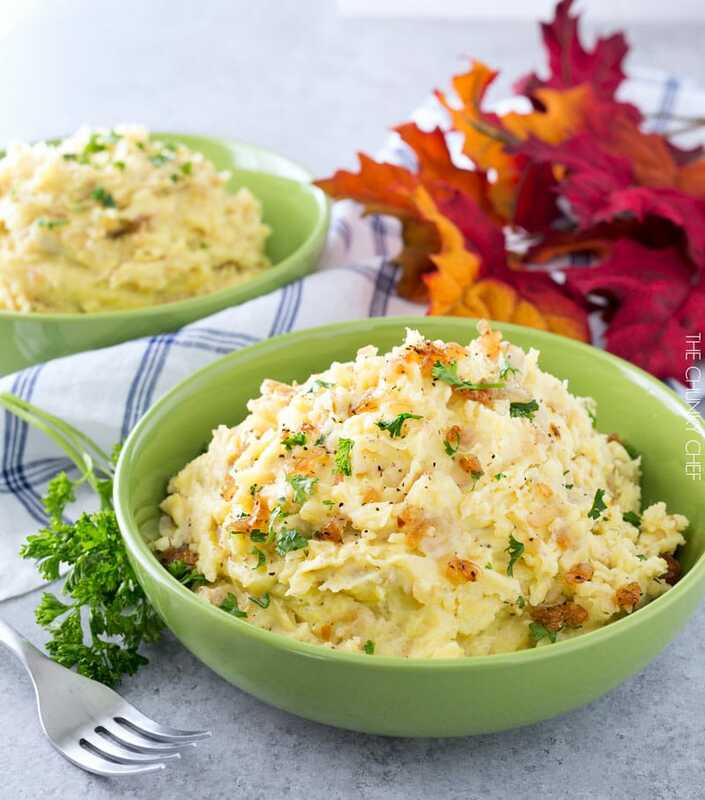 These horseradish mashed potatoes with caramelized onions are an exciting twist on a traditional dish... full of mouthwatering flavor combinations! 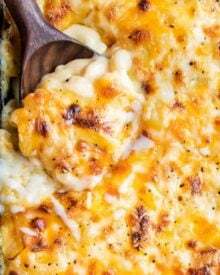 Add 2-3 Tbsp butter to a large skillet and heat over MED to MED-HIGH heat. Add diced onions to pan, and saute, stirring often, for 3-5 minutes. Reduce heat to MED-LOW and saute, stirring occasionally, for 10-20 minutes, until onions are soft and golden brown in color. If using baby yukon gold potatoes, halve the smaller ones, and quarter the larger ones. Add sliced potatoes to a large clean, dry pot. Cover with cold water, about 1" above the potatoes, and season with 1 tsp salt. Cover, and bring to a boil. Once boiling, remove lid and boil for 15-20 minutes, or until potatoes are tender when pierced with a fork. Drain potatoes, then return to the same pot. Microwave heavy cream and butter for 1 minute, then pour over cooked potatoes. Mash until desired consistency. Alternatively, beat with a hand mixer. Use a wooden spoon to stir in salt, pepper, dijon mustard, horseradish and caramelized onions. 2. I chose to leave the skins on my potatoes, but if you prefer skinless, just peel them first. Yuuuummmmmm. I wanted a meat-and-potatoes meal to make for the ol man tonight – found your one pan pork chops with apples, and this was suggested as a side. I pre-made them, had a healthy sampling, and they’re going to stay warm in the oven til we eat. I might broil the top. DELICIOUS. He’s going to be pumped. Thank you! Do you think you could substitute cauliflower for the potatoes? 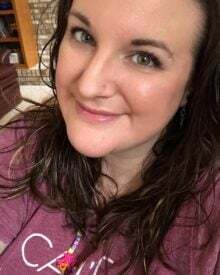 I’m new to your site & love it! Hi Patty 🙂 I’ve only tested the recipe as written, so I can’t say for certain, but I think that would work okay. Welcome to the site! This sounds delicious! I cannot wait to devour some! No no no I can’t think about Thanksgiving yet! I’m still loving Halloween right now haha. Love these mashed potatoes though! Since I’m from Idaho we eat potatoes almost every day! I’m always looking for fun new ways to serve them and this dish looks fantastic! I love the onions on top! Give me a giant spoon! Yum! I cannot believe Thanksgiving is next month! I love the addition of horseradish. I’m sure it adds such a kick of flavor! 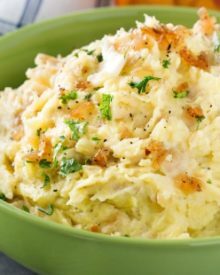 my husband is a BIG fan of mashed potatoes, I can’t wait to make these for him!